The fireplace guys came and hooked up our gas fireplace and put the trim piece around it. Looks nice. It does put out nice heat and I guess there is a battery back up thing, that if our power goes out, we can still have heat blowing from the battery power. Still no mason guy. He did call DH this morning and said now he'll be out later in the week to get started. I just got a call from the cabinet lady. She won't know until Friday what day the cabinet is supposed to be delivered to their shop (the following week), but she has talked to the granite people about keeping our schedule going. They will come out to template, either tomorrow (as scheduled) or possibly Thursday. That is fine, as then they said they need 3-5 days to cut the granite tops, which by then the replacement cabinet should be in and installed. The excavator guy and a helper (and some help from DH) worked all day yesterday getting more of our rockery areas done. Got the first driveway lined on each side and an area in front, where we will have lawn. They are working again today (but with no helper), and should have most of it done by the end of today. He's working on a very short wall behind our shop and between us and our neighbors, today. Our neighbor lady asked if we were putting in a couple steps between our lots (out lot slopes down a a bit to their lot)...so we can visit each other without having to walk out to the road and around, LOL. Yes, we will ;) and that's where will put the gate between us, too. The dishwasher is to be delivered this afternoon, sometime. I am feeling really tired this morning. I feel like I slept good, though. DH's buddy sold a few of his acres. They just really need a vacation, he said, so are using some of the money from the sale for that. So, they and their 2 teenagers spent 13 hours in a car to their destination, spent 3-4 days sightseeing, and 13 hours back in car. No thank you, LOL. I just went next door and let old pooch back in the house, as she had been laying outside by herself, again, for awhile. Poor old girl. I wonder why she can't seem to get back in the doggy door now. She can get out, LOL. Neighbor said she has a vet appointment for her next week. Neighbor guy picked a good week to go out of town - he doesn't have to work at home and listen to the backhoe and rock noise these past 2 days. It's kind of a busy/noisy day here. We're supposed to have 4 subs here....mason, framer (to finish staircase railing), rock movers, and plumber. So, far the framer and heavy equipment/rock mover guy is here. Then the fireplace lady called and they are coming later this morning to put on the final trim piece and hook up the gas and show us how it works. They didn't want to do this part, until all the trim work was done and no dust everywhere. I got an email Friday afternoon from the cabinet lady that the cabinet isn't even supposed to ship until week of 4/29 now. What happened to 7-10 days production plus 4-5 days delivery...putting it HERE at the end of this week? 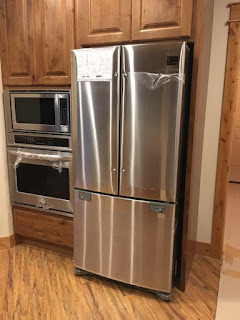 I just sent her an email earlier this morning, asking that very question and then said how about, since this is the 3rd try to get this cabinet right, the factory ship this overnight so it is here in time for our countertop scheduled time? I also asked what is going on with the upper cabinets that had to be replaced (wrong size)...it has been almost 6 weeks for those? Longer than they took to make and get there the first time? The way the granite people explained to us, is they come in (the 24th is when they scheduled us) and template it all. Then come back in 5 days, to do the installation. I asked the cabinet lady to emphasize with them that they could still come in on Wednesday and do their templates and when the come back the next mid week (as I'm assuming they meant 5 business days) the cabinet will be here, or they could start on bathrooms and laundry and do kitchen last. Our neighbors now have their son's 2 dogs until July. They did bring bark collars. But, neighbor guy is out of town on business this week (usually he works from home) so no one home all day, this week. They all only barked a little bit, when the backhoe got delivered. Then I got an email from neighbor lady, telling us she hopes they don't bark all day (she's at work) and their oldest dog, for some reason, is now having trouble getting back thru the doggy door, so if we see her outside all day, could we go open the door for her to get back in? of course! That is my favorite of their dogs, LOL. I can't have my girlfriend stuck outside, haha. But, it's a nice sunny day, so it's not hurting her to be out there for awhile. That's what she usually does anyway. She just likes to sit and watch all the goings on. She's an old girl, like 11 and getting up there in age. My boss is back working, from home this week, and then will be back in the office next week. Glad she is back. I only had to sign 2 contracts while she was out, LOL. We decided to use our tree lumber to have the farmhouse dining table made. The guy came and picked up the lumber from us yesterday. We sure do like him. I think DH has made a new friend, in him, already. He also said, if it cracks too much, then down the road, we can always add some more urethane in the cracks and I said that is what I was thinking, too. We are also going to use our live edge slabs for our kitchen bar countertop and then have him burn in some "scene" in the top. Not sure what yet, but I think it's sure going to end up one of a kind, when it's done. Just some kind of wild life scene....deer/elk, etc. We've kind of realized, that for the most part, the people we meet, who are the nicest, are also transplants, LOL. This woodworker guy has lived here about 4 years, from another state. There are a few long time locals who are super nice, but many just don't like the "outsiders". But, we haven't met anyone, who is an "outsider", who hasn't been super friendly. Everyone who has moved here, from other places, really seems to appreciate living here. The people that have lived here their whole lives, not so much. I didn't see an email the cabinet lady sent Friday afternoon until Saturday. I had stopped working at 1pm and didn't get back on my computer. The "replacement cabinet will be here in 2 weeks" now is changing to 3 weeks. There goes our schedule for the countertops to get installed. We are so mad and disgusted. How about, since this is the 3rd cabinet to try and get right, the mfg ship it overnight?! 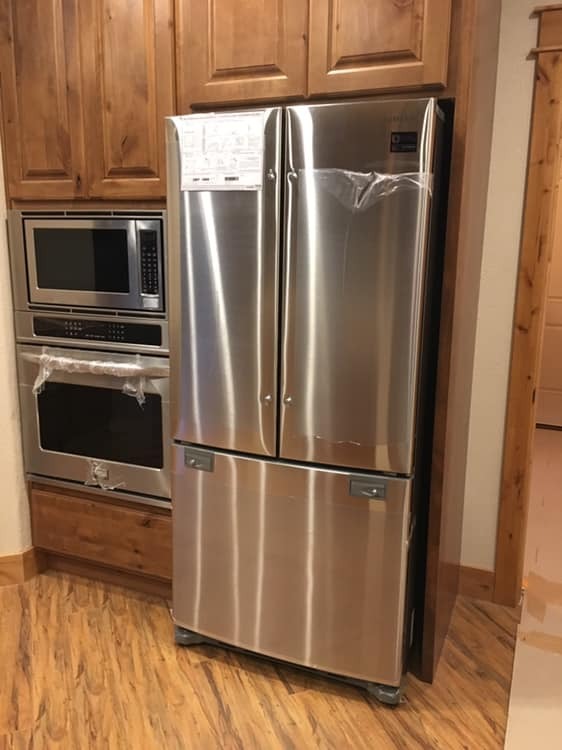 The other evening, Dh had gone over to that wood working guys place to talk and then didn't get to stay but a few minutes, since the refrigerator was being delivered. So, we both went back over there after dinner last night. What a nice little place he has. His house sets in the woods on the edge of a clearing. His nice lawn and trees, all looks like a little park in the woods. And his little house is so tidy and decorated so cute. I was so surprised for a 72 year old guy, haha. All his cabinets and table, etc he made himself. Rustic but very nice stuff. He does really good work. So, we ended up spending 2 hours there, visiting with him. And he showed me his chickens :) While we were in his living room, the next thing you know he's got 5 does out in his front yard eating from plates of corn he leaves out for them. He says the come just about every evening. Then a wild turkey showed up, like he owned the place. The does didn't like him much, LOL. So, neat. This guy also does wood burning pictures/scenes in wood. He had a whole bunch that he had done up and framed, that he sells. He's very talented and that's how he supplements his small social security income, along with building tables and such. His ears must have been ringing because as I'm typing this out, DH's phone he left on the desk, rang, and it was this guy. We/I decided to use our lumber for the table....cracks be damned! I'm sure it will turn out great and I like rustic, so if it cracks, it cracks. Plus, just about everyone, from those of you who commented on my post, to a couple of my friends I texted with, said to use our wood and have the cracks. This morning I've just been vacuuming our little carpet area for our "bedroom/office" in the shop and cleaned the bathroom. It stopped raining and the sun is starting to come out. Of course, after our neighbors did an Easter egg hunt with their grandkids. It seems I can do nothing right for DH, of late. On our way grocery shopping he's telling me a story of a conversation with the two guys installing our staircase railing (the framers). One is coming back to finish it up on Monday. He was the one who last Fall, missed out when we bbq'd steaks for the framers and roofers, so DH told me he told him he's taking him out to lunch on Monday, for steak. LOL. So, I buy our usual groceries and steak for 2....as I'm putting them away in our little fridge he says didn't you get enough so I can do steak on Monday? No...you said you were going out to eat..?! Then he's complaining because I don't have any cash in my wallet. I should always have $20...I said I did just have $20...I gave it to YOU a couple of days ago to rent the hammer drill! I just haven't had time to get more cash, already. Geez. It's not like there's a bank/ATM down the road. Then he's mad because I didn't see the email about the cabinets until Saturday. Like, what was going to be done about it with 3 business hours left in the day Friday? It's not like the cabinet lady every answers her phone or returns calls timely, anyway. I got to quit work at 1pm yesterday, which was much needed. I decided to wait and go grocery shopping this morning and DH went with me. First we stopped at Lowe's and returned the first ceiling fan/light I had purchased, that our electrician said I wouldn't like it that small. So, there was a $150 credit. DH, of course, needed more things at Lowe's so there was another $40 spent. Then we stopped at Harbor Freight as he was out of latex gloves. I said that is all we are going in there to get! He couldn't believe he wasn't going to get to look around and see what he didn't know he needed. LOL. We got our grocery shopping all done. They were having a good sale on soda, so DH loaded up his cart with that, to stock up on. He's learning to watch prices. On the way home we swung by our HVAC guys house. He said our dryer vent was in the back of his work pickup truck, so we grabbed that. It started thunder and lightning last night and then pouring rain. Hasn't much stopped raining since. As expected SIL's story on the will and sale of house changed again. Got a message yesterday that the house sale closed the day before. (we were told 4-5 days earlier it wasn't going to be able to be sold until probate was done...), so that is very good news. She said the proceeds from sale will go into the estate account, until probate is done. Plus, DH received a letter from the attorney handling the will, kind of outlining what happens. Yesterday the notice to creditors was filed, so now I guess they wait 120 days to see if there are any creditor claims on the estate. The letter didn't say how long it might take to finalize probate after the 120 day waiting period. We have no Easter plans. Still can't make a real meal, so not going to worry about it. Maybe we'll go out to dinner tomorrow. We haven't been out to eat in a restaurant for probably a couple of months, now. Just got an email that our replacement (2nd time around) cabinet isn't shipping until a week from Monday. So, who knows now when we'll get put back in the schedule with the granite installers. Beyond frustrating. The stair railing is finally getting done. They think they will be able to finish it today. They were still here working when I got done working yesterday, so since it was sunny and 70 and I was tired of listening to the puppy bark/whine/and try to howl, I went outside and let her out of her little crate and played with her until they were done. She couldn't have been any cuter, but like grandkids, then I got to send her home, haha. DH and I ran into town mid day to get some stain for the staircase posts (they were supposed to have brought them stained, since painter lady isn't here anymore). Thankfully the tiny hardware store actually had what we needed (I called first). And since it's a small town our retired friend, that usually stops to visit us often, saw us pulling into the store and followed us in, to chat. He said "I was going to stop by last Sunday but didn't see your car, so thought you weren't home". We had parked in the garage and said we were wondering where you were, since you always stop by every other Sunday! LOL. They actually worked until 5 yesterday. Then DH and I did a little quick clean up of sawdust with the shopvac and had dinner. DH decided to go over to that wood working guy's place (that had come over the day before about the table) because he wanted to also talk to him about building our daughter a hope chest, as a wedding gift. I said see you in a few hours (cuz that guy can talk....and dh loves to talk too)! I was going to take a nap! Shortly after he left the phone rang around 6pm and it was a delivery guy wanting to deliver the refrigerator. He said he was about a half hour away. I called DH and said he needed to come back home (he was less than 10 minutes away) because the guy was definitely going to need help pulling his 35' semi trailer in. and of course the guy shows up 10 minutes later and no DH yet. I called him again and said get home now. ok, on my way....which still took him like 15 minutes (because the guy he was visiting kept talking!). So, of course the dumb driver pulls up and says "I can't get in here". I'm like my dh will be home in a few minutes, he will guide you in. He used to drive trucks and he designed this driveway so a truck and trailer can get in and out. He didn't want to wait, so he's trying to pull in one of the driveways. I call DH again and say are you almost here?? geez- he's literally less than 5 miles away. He said to have the guy back in the shop driveway, so I tell the guy that and he said that's what he was trying to do. So, he gets where he can start backing up and the top corner of his trailer is about to hit the corner of our shop. I'm like stop! Where in the hell is DH?! Then the guy pulls forward and is trying to keep away from the shop, but the other side of the driveway isn't wide enough (or so he thinks) and he's saying I can't do this. Finally, Dh pulls in. Guides him right back up to the front door entry, no problem. Guy unloads it and puts in on a hand cart and brings it into our kitchen. So, now I have a new fridge - that I can actually put a whole gallon of milk in and DH doesn't want to use it yet. Gah! Well, the framer showed up this morning to do the staircase railing. (yay). But he brought a little hound dog puppy with him. I could (almost) see doing that if he was doing outside work, but not when he's working inside the house and can't see her/be with her. She is not liking being kept in the back of his little open, 2ft sided trailer he brought, so of course it's been non-stop barking and howling....nice way to spend my day trying to work....then, of course she was able to jump out over the short trailer wall and of course went straight to the front door and started scratching at the door and side windows. I am just so sick of all of them. and speaking of dogs - while I neighbors got their dogs all straightened out with the barking, they now are getting their sons 2 dogs (again) until July. Neighbor said they will have bark collars, but they will probably have to put the collars back on their 3 dogs until they all settle down. We met quite the character yesterday! 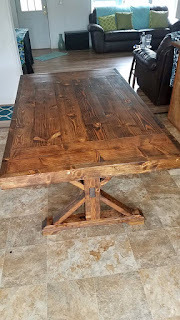 The day before DH had seen this farmhouse table advertised, that a guy makes and sells. $375. Seems like a great price. While he was looking at this on his phone a friend of his called and said what are you up to? He told him he's looking at a farmhouse table ad, so he doesn't have to try and make one! Friend said there is a local guy that makes stuff like that, I'll give him your number. He called yesterday and then came over. We had wanted him to take a look at the lumber we have (from our trees cut) and see if that could be used to make a table. Omg! This guy was something else. I think he was here like 3 hours, non-stop talking. I don't even know how to describe him. LOL. Early 70's, gun toting, "keep off my property" kind of guy...but funny. He's divorced from his wife, but she and her disabled son are living with him right now, while he's building them a house next door to his house and they will live there. 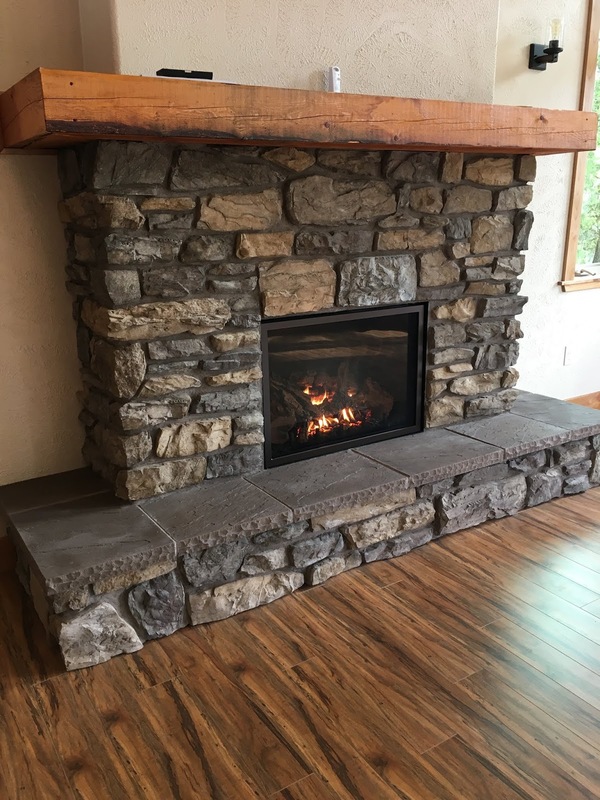 Since the lumber we have wasn't kiln dried he explained that the boards will likely crack in places (as our fireplace mantle has done, but we wanted that really rustic, so it's ok), so he just wanted us to know that, in case that isn't a look we would eventually want. Otherwise, he could use different wood that he supplies. So, now we aren't sure what we want to do. We really wanted to use the lumber from these trees for a few things around here, but I guess the question is exactly how "rustic" I want my dining table to be! I think I'm just so tired of making decisions that I don't even know. We also have 2 big slabs that we want to use on our kitchen bar counter top. That will crack too. But, we really want to use that wood, as it has live edge on it and will just live with the cracks.........so I guess I could live with cracks on my dining table, too. If I eventually just don't like it, several years down the road, we'll just have to get a new table, I guess. It's not like we are entertaining people and need this perfect table. I'm tired of making decisions. Except, it's a bit shorter than I really wanted, so if we had him make us one, I'd go a bit longer, so that 3 chairs fit comfortably on each side. And the guys coming to do the ground work to prep for the concrete slabs in front of garage and shop put us off another day. Now they aren't coming until Monday. Next week will be 6 weeks since the cabinets got started installing and still not done. Well, it's later mid morning and no sign of the framers to put up our staircase railing. No word from the guy, either, of course. DH is finally able to return the scaffolding we have been borrowing since last spring/summer. It had belonged to the electrician that died. The wife said we could use it as long as we needed to. We just weren't expecting this long! (though he has contacted her several times to see if she needed it back). Our neighbor has a little old pick up truck he uses for hauling stuff and told DH the other day if he ever wants to borrow it, he can. DH decided he would use that to return the scaffolding. Called up neighbor to ask and he's like sure....keys are in it - help yourself! haha. Anyway, taking it all down, getting it loaded, and delivering it back is at least giving DH something to do today. One of the things I want DH to build me as soon as possible is a farmhouse table. Well's I guess he's been doubting his building skills, so was looking online and came across a local-ish guy who builds them. Exactly what I want, for $350. Which I think is a really good price. It's a bit smaller in length than I probably would have had DH build, but the guy also takes orders. The original plan was to make it out of the lumber from our trees cut down, so maybe the guy can use our lumber and we'd just have to pay him for labor, if we decide to go that route. DH contacted him, but he's out of town for a couple of days, so we'll find out more later this week. I had a pretty long chat with my mom yesterday. About nothing in particular, but she seemed to be doing really good. She didn't once have trouble with remembering a word, so that was good. DD was a bit miffed at her job yesterday. She has the option to basically start whenever and work 8 hours, so she starts at 6:00am and gets off at 2:30pm (same hours her fiance has, so they can carpool). Now one of the people above her in her dept has decided to schedule a daily phone conf. meeting at 4-4:30pm every day for at least the next 6 weeks. This includes some people from their supplier who are 2 hours later! DD is miffed enough that she has to now be available at 4pm every day, I can only imagine how those folks in the Central time zone are feeling. So, she calls in to the meeting yesterday and no one else calls in. Hopefully the stupid lady that scheduled this realizes how ridiculous that is to expect those in the 2 hours later time zone. Geez. People need a life outside of work in the evenings. I could see a once a week call/meeting, but not daily at that time. There's been a wild turkey gobbling all morning, somewhere nearby. He must be trying to attract the ladies, LOL. Those birds crack me up. We have a friend from where we used to live. Ever since we moved here, he's been saying he's going to move here, eventually. I assumed he meant when he retires (he's like late 40's now). But, I guess he's been waiting for this big settlement on an injury he received to get done and he's using that money to buy something over here, and it's settled now, I guess. He's actually interested in some acreage on the other side of our town. Eek. That's a bit close. haha. He's a super nice guy, but he is sooo loud and one of those that knows everything. I was texting DD about it last night and she said "that's too close...you'll still be able to hear him from there" haha! Plus, he's the type that would say to DH "oh you have your big shop, can I store this in it or use it?" (he's a mechanic). And Dh is the kind who has a really hard time saying no, even though there is no way he would want to do something like that. We just want our peace and quiet, especially after this long build process. Hopefully, it's still a long way off before he moves here. Friday we are supposed to have some more site work done, getting the driveway pads ready for concrete, as well as finishing up the last part of our rockery wall.